From June 21 to July 1, satisfy your appetite for dishes that are gaining ground in the international food scene. It's an impressive bounty of Filipino gastronomic treasures at the Corniche restaurant waiting to be rediscovered for only Php2,780 nett per person. Begin your food journey with familiar flavors that are sure to bring many memories. Starring at the food festival are carefully curated dishes by a Filipino celebrity chef who has brought pride and honor to the country for all his accomplishments throughout the years. 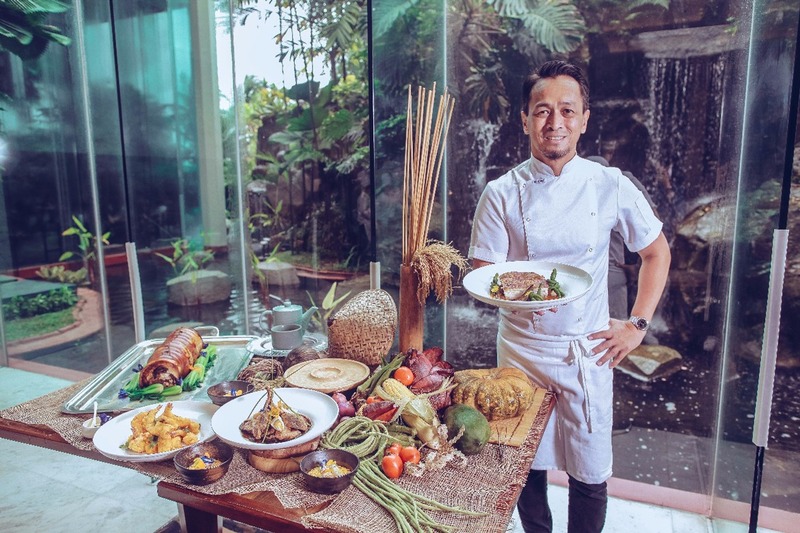 Appreciating the diversity of Filipino cuisine, Chef Sau del Rosario invested his talent in culinary arts, creating innovative dishes rooted in Filipino food culture. Find your way to the appetizers that will be showcased during the buffet, including Oyster Ceviche, a mouthwatering dish made from Aklan oysters with coconut cream, drizzled with calamansi and sprinkled with homemade chicharon for that added crunch; Maya Maya Mayonesa, a delicate classic favorite made from snapper with aioli, capers, black olives, eggs and spices; and Paku with Kesong Puti and Watermelon, a healthy mix of forest ferns from Pampanga served with palm vinegar and salted egg. For the showstopper, get ready to give in to these sinfully delicious courses. A must-try is the Crispy Pork Kare-Kare Macadamia which is Chef Sau's signature dish cooked with macadamia nuts and truffle oil. The Sisig Paella is his trophy dish featured at his recent Napa stint that became a blockbuster to many foreigners. And of course, skip the diet for a day and get yourself some Lechon, an attention-drawer and crowd-pleaser in any celebration. Other dishes that will be served are Tamales Pampanguena, Sinigang Flan, Bangus Relleno, Lamb Adobo with Garlic Confits and more. Young, award-winning Chef Miko Aspiras is taking the dessert buffet spread to a new level of experience. Take a bite of Chef Miko's tempting Mansanas crafted from dulcey-cinnamon mousse and Granny Smith apple compote dipped in red glaze decorated with chocolate leaf and twigs. Strike your fancy with Cherry created from layers of fluffy chocolate sponge, cherry mousse and cherry chantilly. Find true bliss in the luscious yet citrusy Mandarin Cheesecake in Graham crust base garnished with fresh orange segments. At the live station, fall in love again with the Diamond Hotel Ensaymada served with Flambéed Morada and Rosella. Chef Miko will also feature other equally irresistible confections such as Dayap in coconut mousse with dayap curd dipped in praline cocos, Keso de Bola Macaron, Grape Choux and more.